All six Chesapeake Bay Guitar Project guitars were completed on schedule and were unveiled at the Festival hosted by Emory and Charlene Knode at the Appalachian Bluegrass Shoppe in Catonsville on May 17. The event was a huge success, with a number of great performers playing the guitars, singing, and entertaining the festival attendees. First up were Bob Walters, Mike Walls and Deb Peitavino, who performed a selection of songs, including “Chesapeake," an original song that that Bob composed specifically for this event. They were followed by Andy Rathgeber (pictured), Charles Roe, Michael Cassidy and his wife Joie Frye, and Pat MacCubbin, all very talented performers. Rick Landers and photographer Mike Davis were present from Modern Guitars Magazine. Rick conducted an interview with myself and Emory, while Mike took some great shots of the guitars, the store, and the event happenings. The interview and photos have been published on the Modern Guitars website. All in all, this was a great day, with live music and refreshments, the Chesapeake Bay guitars, and staff from the Chesapeake Bay Foundation providing information about their efforts to preserve the Bay. There are guitars still available for purchase, and they are on display at Appalachian Bluegrass. To inquire, please contact Emory Knode at Appalachian Bluegrass either by phone (410-744-1144) or Internet website (www.appalachianbluegrass.com). My heartfelt thanks to everyone who helped make this project and event a success. A special thanks to Craig Lavin for his beautiful and inspired inlay artwork on the guitars. He is a true artist. Now that March has come and gone and we’re into April, there’s quite a bit of progress to report. The first three guitars are now finished, and work is well underway on the other three. Ladies’ Night: inlayed onto the Peruvian Walnut backed guitar, depicts female crabs foraging through eelgrass. Heron Sunset: inlayed onto the Brazilian Kingwood backed guitar, depicts a setting sun silhouetting a great blue heron, with a close-up on the neck of another heron among the cattails. The Fisherman: inlayed onto the Quilted Sapele backed guitar, depicts an osprey coming in to capture a fish for its dinner. Stars and Stripers: the fourth guitar underway, places the viewer within a school of striped bass and has a starfish sitting at the bottom. All this sits below the Francis Scott Key nun buoy on the headstock. This buoy is located in the Patapsco river mouth and commemorates the location of the British ship that held Francis Scott Key when he composed the Star Spangled Banner. 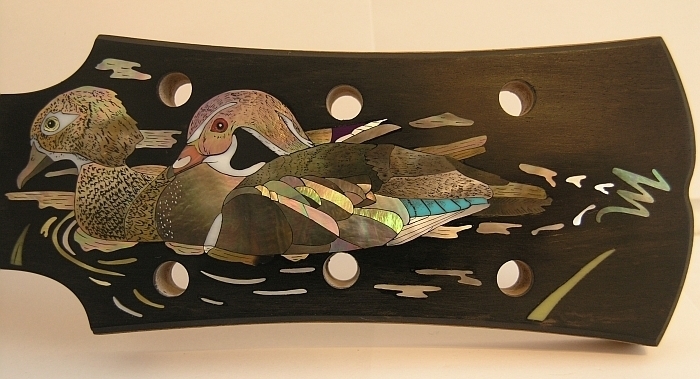 The Duke and Duchess: the fifth guitar underway, shows a pair of woodland ducks in marsh grass. I should have the artwork for the sixth guitar shortly. The first three guitars headed to the Newport Miami Guitar Festival to be displayed with many other custom guitars from April 11 to 13. They will be coming back after the show and all six will be displayed at Appalachian Bluegrass in Catonsville as completed until the Chesapeake Bay Guitar Project Festival there on May 17. This local festival will not only have the guitars on display for sale, but there will be staff from the Chesapeake Bay Foundation present, supporting the event, as well as live music (we’re hoping for some original works that speak to the Bay) and refreshments. More information can be obtained from Emory at Appalachian Bluegrass (410-744-1144) or on his website (www.appalachianbluegrass.com). The Chesapeake Bay's nautical and watermen's cultures have long been an inspiration for local musicians. Now they are inspiring a few other members of the music business. Soon, thanks to the vision of three talented men and their Chesapeake Bay Guitar Project, you won't just be able to sing about the Bay, you'll be able to make music with it. David MacCubbin is a Maryland native with a lifelong love of woodworking, music, and the Chesapeake Bay. A singer and guitarist, David built his first guitar in 2001, learning the craft from renowned luthiers (guitar makers) William Cumpiano and Ervin Somogyi. Early this year he switched his career path from software engineering to building guitars full time, and has completed a number of commissioned instruments. Born in Pennsylva, Craig Lavin's love of sea life and music took him to Florida and to a degree in marine biology and a side-job as a guitarist in a South Florida band. He and his marine biologist and musician wife Emily Schmitt, PhD (who participated in CBF's skipjack summer programs as a youngster) are both involved in marine ecology and education. When Craig wanted a coral reef inlay for the neck of his guitar he became so enthralled with the art that he started doing his own inlays. Today, he is a full-time inlay artist with a special emphasis on marine life. His inlays have been commissioned by individual art collectors, guitarists, and luthiers around the world. Emory Knode's father opened Nelson Knode's Music Centre in Catonsville, MD when Emory was two years old. Emory assumed full control of the business in 1981. Today, the store is the Appalachian Bluegrass Shoppe, reflecting the acoustic and bluegrass music Emory enjoys most. He has also spent countless hours on the Chesapeake Bay boating, fishing, diving, and exploring wetlands. "For a long time, I envisioned some sort of project that would showcase the natural beauty of the Chesapeake Bay and its watershed," Emory says. "It was not until I shared my vision with David and Craig that the idea of bringing the beauty of the acoustic guitar and its voice together to raise awareness of the stewardship we all have responsibility for came together." 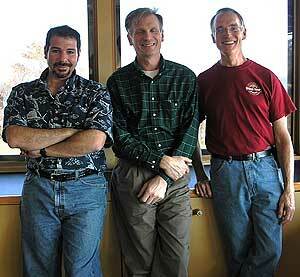 The three men have teamed up to form the Chesapeake Bay Guitar Project. "Our mission is to offer a very limited number of hand-made and hand-inlayed guitars that showcase the splendor of our bay and how we can help to preserve it," Emory says. Proceeds from the sale of these unique guitars will go to the Chesapeake Bay Foundation. "I am very humbled by this opportunity to be able to share my talents in helping the Chesapeake Bay Foundation preserve the beauty and goodness of the Bay," says David. Craig and his wife have been on the lookout for an environmental cause to support. "When Dave called me, I immediately knew supporting the Chesapeake Bay Foundation was invaluable. 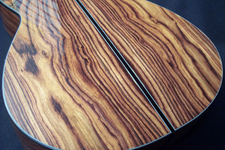 Saving biodiversity through high-end guitar building is wholly unique, I believe," says Craig. "There's way too much riding on this body of water for it to be ignored. I am honored to be part of a project along with Dave and Emory, two other very committed individuals who have so much passion and hope for the Bay's future." But the story doesn't end there. David MacCubbin will be a guest blogger here on CBF's blog over the coming months and will chronicle the project as it, and its guitars, come together.